Ooooh! I do hope the picture shows my good side! I`m Snowflake, a particularly lovely impressionist version of a budgie in a snowstorm. I was turned into an animal shelter because my budgie roommate died and the people who bought both of us at a pet store were afraid I might be sick too. I guess they didn`t know that you can take a bird to an avian vet and find out if we`re sick -- you don`t have to just wait for us to die. Anyway, Mickaboo rescued me from the shelter and took me to a vet and I am a very healthy budgie! It was a very cold day when I left the shelter so my name was a natural. 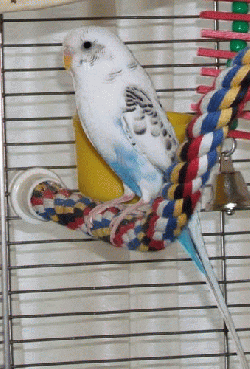 I`m a very young budgie, and Mickaboo doesn`t even know whether I`m a boy or a girl. In fact, I`m so young, I don`t even know yet! I`m a happy little bird, who sings whenever I hear water running -- and sometimes even when I don`t. Like all budgies, I am happy keeping company with other budgies, and I like to play with my toys and eat lots of good stuff, including Nutrian cakes and leafy green things. I`m young enough to learn how to play with people too. So if you would like a birdie that is as pretty as a work of art -- how about a one-of-a-kind Snowflake?